German filmmaker Rainer Fassbinder in an undated portrait (Photo: DPA/AFP). Theo Hinz, the longtime producer of Rainer Fassbinder's films, gives details of the controversial German filmmaker's life. WPR: For many years, you were very close to Fassbinder and knew him well. Do you still think he was “a mixture of a genius and lunatic,” as you once called him? What was it like to work with him? Hinz: When I met Rainer Fassbinder for the first time I didn't know that there was to be a lot of joint work ahead of us, including several films that transformed Rainer into a world-famous director. My first impression was accurate: I was dealing with a fanatic, a man who was ready to sacrifice anything to create a good film. Until the shooting was over he would work for months without a break. Life for Rainer was an endless movie in which he played the roles that formed the lives of the people around him. He lived at the very edge of sacrifice and self-destruction, as if he had decided to realize in a short span of years the fantasies and illusory dreams created by his astonishing imagination. 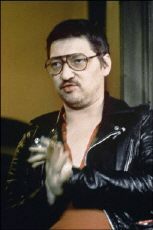 Rainer Fassbinder usually worked with the same crew. They knew his weak and his strong points. We were overwhelmed by his working style: the German film world spoke of the director who in only one year had created three movies of the highest caliber. Rainer possessed a very special, unforgettable, and very individual cinema language. He was a highly qualified cameraman and could work in the lab as well. He was, simply speaking, a universally talented man. And he always wanted to be the centre of the action. Even if he sometimes happened to be involved in a scandal. Was the suicide of his lover Armin Meyer such a scandal? Speaking frankly, drugs, especially, cocaine, are frequent enough in the lives of the celebrities. The scandal surrounding Constantine Wecker, a famous German singer, is still a hot topic in the German mass media, and Rainer Fassbinder surely was not an exception in this particular area. Rainer considered cocaine an integral part of his image, and saw it as a booster that helped propel his creativity. He claimed to me numerous times that drugs gave him an ability to perform better and faster. Rainer thought he would be able to stop using drugs at any time. Unfortunately, he hung on to this belief until the very end. During the scripting of Berlin Alexanderplatz he stayed at his desk for four consecutive days and nights. And then, without any rest, he started work on the scenario of a new movie. It was self-destruction that could have led only to an early end. He could sometimes live without drugs. But it didn't last long. As a result, his natural balance was irreparably broken and we lost a man who was probably the most talented German director of all time. I remember how he felt after Armin's suicide. At the time of this tragedy, we were in Cannes, where we were showing our new film Maria Braun. We were staying at an expensive hotel, eating wonderful meals. You name it! And then, we heard the news. It literally destroyed Rainer Fassbinder. He came into my room completely beside himself and kept asking me: "Uncle Theo, what should I do?" I told him, "Get yourself together and make a movie. Talk about a man you knew and loved, about his habits, his weak and strong sides, about his tragic fate." "I have to go to Frankfurt at once and I need money!" And off we went, collecting the money for a new movie. You will not believe me, but the next day Rainer was busy with a new scenario. He never missed an hour or a day of work—that was his style. Why do you think Fassbinder almost always picked Hannah Schygulla to star in his movies? Was there an absence of good performers, or was she simply the best? Rainer ran into Schygulla when she was only beginning her career, on the stage of the "Anti-Theatre." He immediately recognized her great talent. Hannah, in turn, saw in Rainer a great director who was able to give her a very much-needed boost. They needed each other. To speak frankly, there were actresses more talented than Hannah, but she was the lucky one who was noticed by Fassbinder. Rainer Fassbinder was and remains the most prolific director in the history of German cinema. The movie The Fear That Eats Your Soul was completed in just 15 days. His incredible work ethic produced 41 movies in just 13 years. The Fear that Eats Your Soul tells the story of Ali, a guest-worker from Morocco. He comes to Germany to make his living and falls in love with a German cleaning woman, Emmie. The relations between Ali and Emmie in many ways reflect the way German society approaches foreigners. Fassbinder was clearly sympathetic to Ali. Perhaps it stems from experiences in his own background: When Fassbinder was 15 years old, he moved to Cologne to live with his father, who had converted several rundown buildings into housing for foreign workers. The young boy had to collect the rent. The people he met along the way would later be seen in his movies. Fassbinder’s play, The Garbage, the City, and Death drew protests from the local Frankfurt Jewish community, seeing in it certain anti-Semitic outbursts. Do you think Fassbinder was an anti-Semite? It is true that this play caused loud protests in Germany. If I am not mistaken, the main character was a Jewish speculator. I believe that the public's perception of the play was wrong, since Fassbinder did not target Jews, but the system itself, in his play. Unfortunately, this has never been understood. He was never an anti-Semite and treated all people equally. Their race, the color of their skin, or their religion played no role in his attitude towards people. What about his political orientation? There were rumours that Fassbinder supported the "lefties" and, in particular, the terrorists of the Red Army Faction. Not at all. He never belonged to any political party, though sometimes one could have noticed in his remarks some sympathy towards the left wing in our society. It was, probably, a result of, or reaction to, a generally conservative atmosphere in German cinematography, which affected our young generation. But Rainer never liked the leftist radicals. When he finished The Third Generation, in which he made fun of the radical left, he didn't show up at the cinema for the opening of the film because he was afraid of being beaten.